How to remove unsightly black stains from your deck. 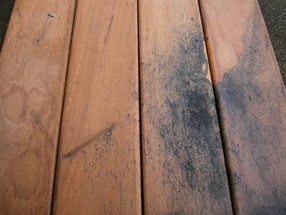 Unsightly black stains on a deck are caused by metal being left on a wet deck. In the photo you can see where a bolt, a bracket and even a nail have been left on the deck and they have left a faint stain behind. That big, black mess that you can see on the right-hand side of the photo has been left behind after some metal has been ground on the deck and the metal filings haven’t been cleaned off properly. Then when water gets on the deck, the metal filings and the tannin inside the decking boards have reacted to each other and created a black stain. This black stain is near impossible to clean off and when it is as bad as it is in the photo, you have no option but to sand back the deck. To prevent this from happening to your deck, it is best to clean your deck daily making sure to remove anything metal from the deck. 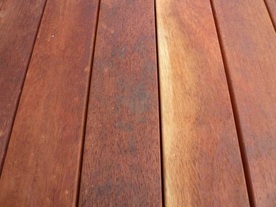 Even leaving other bits of timber on the deck can lead to stains which are hard to remove. Kwila timber is especially bad for this, as it is a wood that is heavy with tannins. Tannin is the sap inside timber and even though the majority of decking boards are ‘kiln-dried’, they still have a level of tannin in them. One product you can use to clean the deck if you do have these black stains is ‘Deck Clean’, which is a mild acid. If you decide to remove your black stains by cleaning with Deck Clean, you need to scrub like you have never scrubbed before and you will have to repeat the process at least a couple of times. In some cases you will have no alternative but to sand the deck back. For more information of on installing decking boards have a look at our “Installing Decking Boards” guide which is available from the Resource Shop. Water leaking in behind the gutters and facia? 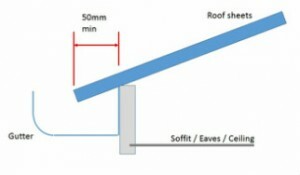 2) the more common reason is where roof sheets are cut too short or they don’t overhang far enough into the gutter. What happens in this case is that water has this capillary action which means the water travels back up the underside of the sheet just a small amount. Now when you add wind, the wind blows this water further up the underside of the sheet and if there’s not enough overhang into the gutter, the water will actually find its way over the back of the fascia and inside your ceiling or somewhere else it’s not meant to be. 2) assuming that you have at least a 20mm overhang into your gutter, grab a pair of pliers or multigrips and bend down the valley of your roof sheets into the gutter. Now this may help reduce the amount of capillary action and also reduce the effect the wind has when blowing the water back up the underside of the roof sheets. It may not work; it may work; but it’s definitely worth a shot. For further reading, check out our other “Articles”. What is a gum vein, and how does this affect your decking boards? We have all seen gum veins in decks, even though we may not have known what they were. Gum veins are the white or lighter parts of the decking board. A gum vein is the build-up of resin or tree sap and can be identified by the vast difference in colour on the same board as shown in the photo. At their centre gum veins are white in colour and have very few timber fibres in them. As you move towards the edges of the gum vein they become darker in colour. The white part of the vein at the centre is very soft (you can indent the white vein with your fingernail). As you move towards the edge of the vein, it becomes harder on account of the increasing amount of timber fibres. So what does this mean for your decking boards? Gum veins are a defect in the timber, a weak point. With regards to decking, the strength of the timber is not as much of a concern when compared to a vein being in a structural timber beam, for example. However the durability (ability to resist rot and wear and tear) of the decking becomes a concern as the gum veins are susceptible to rot. Always cut out the white/centre part of the gum vein even if by doing so that means you need to throw away a full length of decking board. Whenever possible avoid using decking boards that have an outer edge of a gum vein in them. By following these suggestions you will have a great looking deck that will last the distance. One method of connecting your floor joists to your bearers is to check them into the side of the bearer rather than sitting them on top of the bearer. This is commonly done to help reduce the depth of the sub-floor frame and it is especially effective in a couple of situations: when the deck is close to the ground; or when the deck is on the front of a house and you want the bearer to hide the ends of the floor joists. 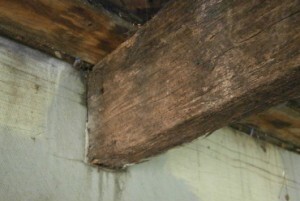 However this method of checking the joists into the bearer has its own unique problem: over time the floor joists have the potential to work themselves out of the housing, due to the deterioration of the fixings holding them in. To overcome this problem it is recommended to use a metal bracket and screw it to the bearer and then to the joist or you can use what’s referred to as a joist hanger, which is when the joist itself is actually nailed to the bearer via a bracket that the joist sits in. Joist hangers are designed so that you don’t have to check your floor joists in the bearer and offer more stability than just checking a floor joist into a bearer. In 2008 a deck in Brisbane collapsed killing one person and injuring plenty more. It was found in the coroner’s report that the cause of the deck collapse was because over a period of time the joists had worked their way out of the housing that they were checked into. Keep in mind when planning your new deck or even renovating an old deck and space is limited, butting floor joists into the bearer is a good option just pay extra attention to how you are going to secure them in place. For further reading, check out our “Articles”.